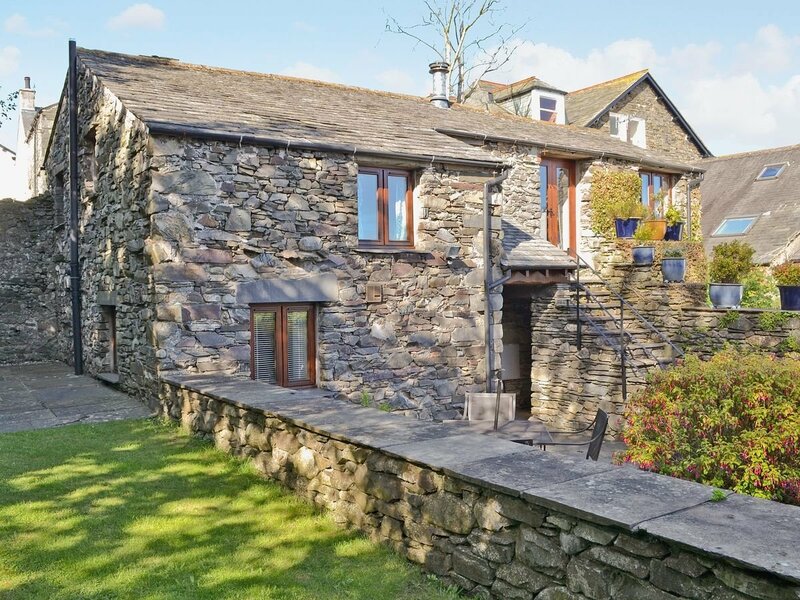 This holiday property is situated in the heart of the historic, 11th-century village of Broughton-in-Furness, which is full of old world charm and is the gateway to the beautiful Duddon Valley. The Little Griffin is an attractive, detached barn conversion which stands in a pretty, walled, south-facing garden. Cosy and equipped to a good standard, the cottage has a quirky layout, with a kitchen, dining area, walk-in shower and bedroom on the ground floor, and the living room, twin bedroom and bathroom on the first floor. It is neatly tucked away off the road, 20 yards down a private path under an ancient arch. The Griffin (LP8) is directly in front of The Little Griffin (LUW) and can be booked together to acccommodate up to 10 guests.Entrance lobby. Attractive, modern fitted kitchen with tiled floor and dining area. Shower room with walk-in shower and toilet. Double bedroom with 5ft four-poster bed and French windows to patio. First floor: Living room with ‘living-flame’ gas fire and French windows to stone landing with steps leading down to patio. Twin bedroom. Bathroom with over-bath shower and toilet. Be the first one to tell us about your rental experience while staying at The Little Griffin. Let us know if the listing matched your expectations. You can share your comments about the location, property owner/manager and all the unique features that made your stay a memorable one.